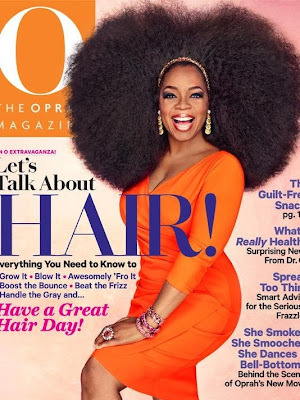 Oprah's Hair, What Does It Mean For Black Women? The September Issue of O magazine with its namesake on the cover is getting a lot of press. The Queen of Day Time Talk is posed with a 3 pound plus wig that gives us a curious combination of Diana Ross Live at Central Park, Millie Jackson and in modern age Beyonce and um let's not forget The Cowardly Lion/Lion King. Created by celebrity hairstylist Kim Kimble of WE reality show fame LA Hair and styled by Lady O's long time hairdresser Andre Walker, the voluptuous mane is polarizing if anything. It has created a lot of talk, about hair and specifically Black hair. It also shows Oprah who is known for having an incredible full mane herself exercising a fun and fearless attitude of self expression. It's just hair dammit, it's not that serious and if Oprah can throw on a three pound wig who are we to judge. The debate about Black hair has become the most annoying topic, replacing the whole Single Black Women pandemic, which replaced the Black Men on the DL issue that lasted for over five years. You see, I have a relaxer and I like having one. Not because I am a traitor to my race or I hate myself (anyone who knows me can tell you I suffer from extremely high self esteem as well as a strong love for my race and culture) the relaxer makes my life a little easier. My hair is relaxed not because I supposedly hate my natural texture, again if you know me, I space my touch-ups to epic distances and I spend the Summer months not in the salon but usually a more natural air dried and curly hairdo. Last summer, I bumped into a former coworker who had a great cut and style and she was natural, I complimented her on the whole look, she replied that she felt sorry for me for having a relaxer. It was not only a slap in the face but it was quite unnecessary and grossly uncalled for. You can inbox me for my response because you know I didn't let that slide. Nonetheless, I tried to process how my hair and her hair had now made us sworn enemies. No I'm not being dramatic, everyday I'm bombarded by stories from friends as well as social networking media where Black women are exalting themselves as more real, more beautiful because they are either pro natural or anti natural. It's like the scene in School Daze playing itself out in Media all over again. Sadly, the black hair care industry which is rarely owned by Black people is making a fortune off of it. Somethings that leave me in awe is hearing women my age, hell many whom I went to school, with claim they don't know how to manage their hair. As if they have a 24/7 glam squad during their years in NYC Public Schools and as though their middle management careers created the luxury of never having to know what shampoo was being used on the,. I can't help but chuckle and try to understand in the digital age how you're unable to research beauty products, or even read this blog which is one of many dedicated to hair care. Yo change your look and not do the research for the upkeep? What woman does that? That's when I ask myself, are you doing this as a trend, or even worse did you do this for attention, to become a part of something shallow and not part of the true post racial movement? Will this become your only topic of conversation as well? How I cringe with anyone who talks about the only self absorbed topic any and everyone time you see them. How about those Yankees- oh can we talk about my hair? Did you put cumin in this dish- can we talk about my hair? It can be both polarizing and exhausting for all surrounding parties. India Arie said it clearly, I am not my hair nor does my love for self and those in my race be declared by my hairstyle. If you think your power lies in your physical adornment, hair style, weight, tattoos or anything else, you are sadly misguided. To some, a hairstyle is a major statement a declaration of their position in society, a creative expression, at that same time to many, a hairstyle is a matter of basic personal grooming with the basic thoughts. Then there are those in the middle, hair being for women especially Black woman an expression of beauty and as we know like body shapes and skin tones, we are all beautiful in all ranges.